Pretty with vibrant contrast of hand painted decoration on a pink background. 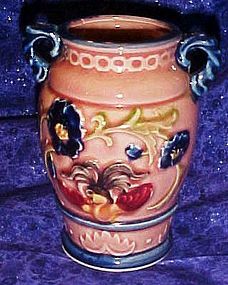 Made of heavy glazed ceramc with relief paterns of flowers and scrolls. Measures 5" tall. 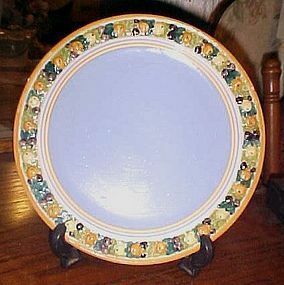 No chips or cracks, but there is crazing which is typical of these older pieces. Japan ink stamp under glaze. Large robed Guru frog figurine, playing the mandolin. 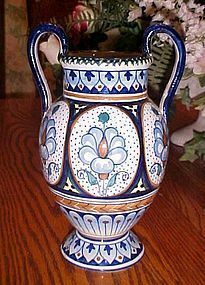 Majolica pottery. On the bottom are the numbers AC:158. No damages at all. Overall crazing. Measures almost 11" tall. Not sure of the date, and hard to even guess. You'll have to be the judge.Email me if you need to see more photos.